Written on June 24, 2005, and categorized as Secret and Invisible. Changes: the end of the old and the birth of the new. 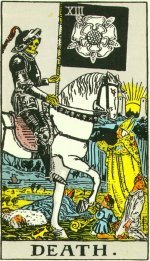 One of the reasons Death is feared is because we have lost and are still losing touch with our natural place in the order of things. 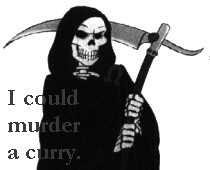 The Grim Reaper is an abiding image from a bygone age. Urban life with its myriad palliatives and distractions removes us from seeing Death as part of the great cycle of existence, an inevitability to be celebrated. The Hindu Goddess Kali, Goddess of fertility, death and regeneration, is also known as the Mother of All Compassion, yet we view Death not as bringing the kindness of release, the grand fulfillment of our final destiny, but as our sudden product unavailability, the body, having passed its sell-by date, removed from the supermarket shelves. Yet, urbanisation is accelerating. As Bob told me the other night, in Africa, 67% of people currently live in rural areas and the rest in cities, but in 20 years the ratio will be reversed and 67% will live in cities. The mechanisation and rationalisation of society, and the promotion of the concept of the “global market” has brought such alienation from our origins, where we had a context for Death and could make the comparison with harvested corn. As we in the “developed world” start to despair at the conseqences of the industrial revolution, soon that concept of the world being a place run for profit will die, as all things do, and be replaced by the long lasting legacy of this brief, insane phase of short-sighted consumption, the “global desert”. My favourite Death has to be that wonderful comic character drawn by Terry Pratchett. I read little comedy fiction these days, restricting myself by necessity to the gatefold sleeves of 1970s LPs, but I have read several of these books on various jaunts and they have the rare gift of causing me to laugh aloud and grin stupidly on trains and aeroplanes, and then I imagine myself living in the fantasy world that Mr P. summons up so enduringly, speaking portentously, and holding conversations with inanimate objects. If you ever hear a tall hooded chap speaking in CAPITALS and carrying a scythe, don’t panic. Death is not so bad, he’s actually quite a fun guy. He has his own songs, and he likes cats.